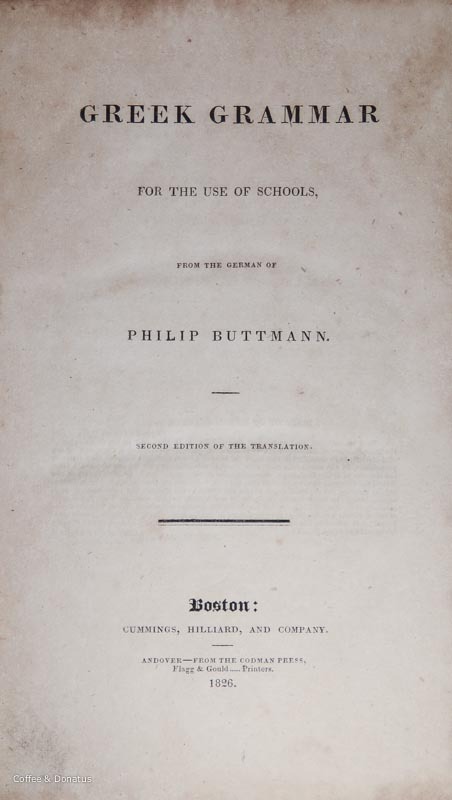 Title page from Edward Everett’s translation of Philip Carl Buttmann’s Greek grammar, entitled “Greek Grammar for the Use of Schools” (Boston: Cummings, Hilliard and Co., 1826). 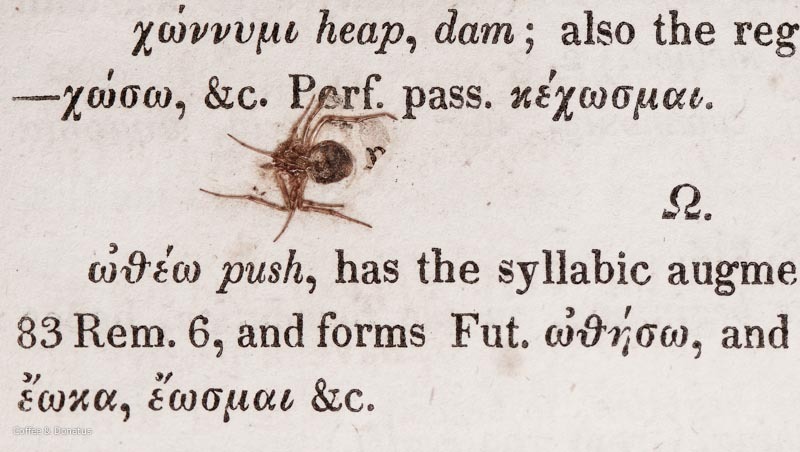 For nearly two centuries, it’s possible this little insect has been buried here, in the second edition of Edward Everett’s translation of Buttmann’s Greek grammar. Everett, the Greek scholar, United States congressman, pastor, professor, diplomat (the list goes on) is remembered as one of the great American orators of his time. In 1863, he gave a much praised, but now often forgotten speech just prior to Abraham Lincoln’s Gettysburg address. With his keen interest in Greek history, literature, and language, Everett’s speech was steeped in the ancient linguistic traditions of Greek funerary oration known as epitaphios. Everett earned his doctorate in 1817 from the University of Göttingen, a leading center of linguistic scholarship. It’s likely he was long acquainted with the popular grammar written by the German philologist Philip Carl Buttmann, which first appeared in Berlin in 1792. The first edition of Everett’s translation was published in Boston in 1822, while he was teaching Greek literature at Harvard. Another edition appeared in London in 1824. Titled as the “second edition of the translation,” our learned spider’s copy was printed in Boston in 1826 and compiled by the historian and statesman George Bancroft along with George Bode. In the preface, dated May 1st, Bancroft and Bode stress “the sole object has been to follow the original with exactness. Nothing has been added, and nothing omitted, except an occasional remark relating to the German idiom and not true of the English.” In a separate translator’s preface, Everett assesses the shortcomings (and offers some modest praise) of many of the Greek grammars in use at the time. Note from the editor: Some questions have been raised as to whether or not we have followed accepted conventions of bibliographic description when using the term “laid down” to describe the state of the spider in the opening verse. Not without some controversy, the alternatives “laid in,” and “pasted down” have been proposed. As always, we welcome your perspective, comments, and sense of humor. Greek grammar for the use of schools from the German of Philip Buttmann. Boston: Cummings, Hilliard and Co., 1826.
vii, , 336,  p.; 22 cm. Second edition. This copy described above ends with a 24 page catalog of School and Classical Books by Hilliard, Gray, & Co. Boston. Everett’s grammar is included in the catalog, selling for $2. In the context of the present work, I believe “laid down” to be an appropriate usage, as we currently lack any reliable, first-hand account of the evening in question. Should this change in the future, it will be in everyone’s best interest to revisit the issue.